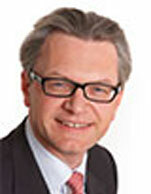 Ole B. Hjertaker has served as Chief Executive Officer since 2009, and served as Chief Financial Officer of the Company from 2006 to 2009. Prior to that Mr. Hjertaker was employed in the Corporate Finance division of DNB Markets, a leading a leading shipping and offshore bank. Mr. Hjertaker has extensive corporate and investment banking experience, mainly within the Maritime/Transportation industries, and holds a Master of Science degree from the Norwegian School of Economics and Business Administration.